I took a walk to my bank instead of driving because I like to walk the walk that I talk so much about. 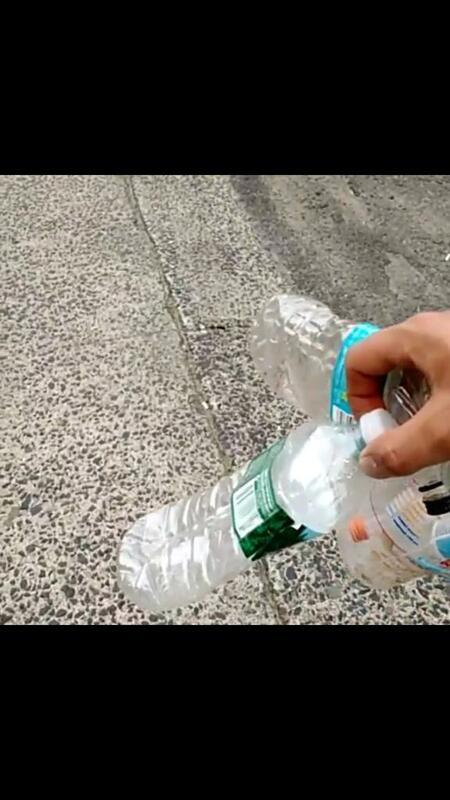 On the way back I started picking up some trash that I saw and threw it out in the nearest garbage – a mile away. In my 1 mile walk (well to be exact it’s like 0.87 miles) but really who’s keeping track. I wasn’t able to pick up everything but I was able to pick up things that could be recycled – 2 little shots of alcohol bottles, a few water bottles, candy wrapper and a cup from Dunkin Donuts/Baskin Robbins. In total I think I got about 10 items of trash off the street and into a recycling bin. 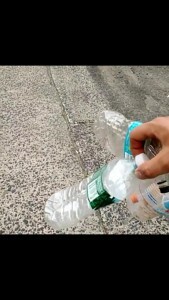 I then went on to post my videos and pictures on my social media outlets and challenged some of my friends to pick up trash either just one day in their life or make it a weekly or daily thing. Then I remembered that blogging is powerful and will be out there always so I am challenging the whole world to this challenge! Please comment what you find! This really isn’t a hard task! Anyone and everyone can do it. If you read one of my first posts (which isn’t hard to find because I have sadly not blogged much, which will change), but I used to bike with a trash bag on my handle bars and I got to about 12 bags full before I stopped biking. Again that will change but when you know longer live in biking distance of college biking isn’t really an option unless I want to spend hours commuting but that will be for another post. So please take this challenge to help make your community, your city, your world a better place. Every little bit you take off the streets and throw out/recycle is making the world that much better. Do your part to keep things clean. If people ask you what you are doing don’t shrug them off! Tell them what you are doing and if they laugh at you ask them take the challenge as well. Good luck on this challenge! If you need more help or ideas let me know I’m here to help make this world better for this generations and the next ones. 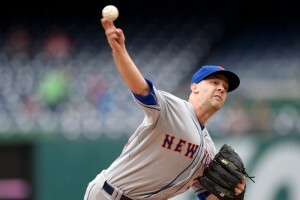 The New York Mets are thinking about trading away one of their better starters and the unlucky man might be Dillon Gee. I think this is one of the worst moves they can possibly make. Knowing that pitchers are having major problems with Tommy John Surgery, their “ace” is recovering from his own TJ surgery and they want to preserve his arm by giving him rest so he can make it through the whole season. Then why would the Mets want to trade any of their pitchers? Everyone in baseball talks about wanting pitching depth so why would the Mets do the opposite? There is a solution for the Mets though! They can solve all their problems by keeping all six of their pitchers: Jacob DeGrom, Matt Wheeler, Bartolo Colon, Matt Harvey, Jon Niese AND Dillon Gee. If they do need to get rid of a pitcher I would say Bartolo Colon, no offense to my fellow latinos, but he’s a bit on the older side, costs a lot of money and reminds me of Oliver Perez – meaning he has one good outing and then could be erratic the next. Just like how Oliver Perez was as a starter; you never know which Perez you were getting from start to start. But Bartolo is still a good pitcher don’t get me wrong, but if someone needs to go why not him? By keeping all 6 pitchers active and pitching regularly they will ensure that Matt Harvey will pitch less and with the off days you can cut his numbers down again even more if need be. Plus you never know when someone might get hurt – going back to pitching depth. You have to play to your strengths – the Mets strength is pitching so do what you can to keep them. Three last points: Bartolo Colon will be a free agent after the 2015 season, Noah Syndergaard and Rafael Montero may not be ready and lastly, pitchers unfortunately get hurt and it’s unknown when extras might be needed. You don’t want to do what the Atlanta Braves had to do when Kris Medlen and Brandon Beachy got re-injured and had to get their 2nd TJ surgeries. They had to get Ervin Santana and lose a draft pick, but that’s what needed to be done because they have no pitching depth. So if a pitcher really truly does need to traded look into the senior of the group – not a good young arm that has been one of the most dependable pitchers in your rotation the past 3 years. I have been a Met fan for many years, but they don’t always make the best decisions. An example to show their lack of thinking for the future (and my ending thought); my mother and I went to a breakfast where past General Manager Omar Minaya was speaking and my mother asked him a question, (mind you she’s not big into sports) “You have burned through all your pitchers before the end of every season. How do you expect to win a World Series with that strategy?” The room went silent and their was no real solid answer. For those of you looking for a Bergen Community College Scholarship here is one. It’s due THIS January 28th, 2014. This is an extended deadline and whoever doesn’t apply isn’t going to be in the running for FREE money; so APPLY. So please download this application, get in you LOR (Letters of Recommendations) and write that 300 word essay. The whole process isn’t too hard you just have it ready to submit by THIS Tuesday January 28th. Drop it off by 5 pm in ROOM L-340 (BCC Scholarship Foundation Office). If you have any questions don’t hesitate to reach out to me, @ivanwei, and I’ll do my best to help. Good luck may the force be with you. New Jersey state’s average for Latino student community college completion – at only 17.1% within 3 years. CLDP Participants are raising funds for travel to Chicago for the USHLI national conference in February and for expenses to complete our last three CLDP sessions. Please help us. As the first crop of Bergen CLDP participants, we will receive scholarships to USHLI’s national conference in February, but our group must fundraise for travel to Chicago and lodging. We also need refreshments for our two remaining evening workshops at the college; and both venue and meals for our all day Sunday workshop, which will be held off campus as BCC closes on Sundays. We need to raise $12,000 to cover expenses for 27 people. Please read our Sponsorship Appeal and help us circulate it widely. We’ll be happy to receive any donation, large or small. Please reach me through the contact info listed in the letter to discuss or tweet me. I am a Bergen Community College student who is re-starting the NAACP Chapter at my college. It has been inactive for about 15 years and I need 25 due paying members to get it re-started. As I’ve been speaking with students about joining I am finding out that a lot of young people don’t know about the NAACP at all. The National Association for the Advancement of Colored People is a 102 year old social justice membership group. The NAACP’s mission is to ensure the, “political, educational, social, and economic equality of rights of all persons and to eliminate race-based discrimination.” There are many students of color at Bergen, and I know that many of us struggle with financial and other issues. We should have the backing of this organization to ease our path through life. The cost is low and the benefits are great! If you are a BCC student and want to join or get involved email me at ivan@weiboyz.com so we can make arrangements to meet and get you signed up. Visit us on FB at Social Justice at BCC page or visit our website. The annual membership is $10-30, but if that’s a hardship let me know – I may be able to help. When you join bring ideas the group can work on – the more ideas the more productive we can be. As you will see 1 way worked much better then the other! Unfortunately, the contraption is STILL in our living room taking up a ton of space – hopefully I won’t have to see it much longer. As for now I will leave you to read the emails from my mother – they are quite funny; I couldn’t stop laughing. Hopefully you think the same and if not I will try to make you laugh over time once you get to know me and learn about my sense of humor. “Anyone feel like laughing at me today? Take a look at these two Freecycle ads. The bottom one I wrote two weeks ago and it netted no responses. It’s completely insane, which is probably why. The top ad, which I wrote tonight, someone responded to a few minutes after it posted. It seems to be all in the packaging, people . . This got me a request for our “chair” on Freecycle within 15 minutes. I have here a nice looking wooden chair frame. A single-sized futon cushion gets draped over it, but you’ll need to supply that. It’s oak veneer, pretty looking. Please include phone number with response. This got us no responses at all. It reads almost like a parody of an ad, like someone was trying to figure out how to make the give-away item as unappealing as possible to make sure no one would ask for it. I wrote both of these ads, more’s the pity. We have a wooden futon frame which is single size and converts from a chair to a bed. As a chair, it’s got all of its wooden pieces, but as a bed it needs a bit of work: one of the legs that holds up the extension that makes the foot of the frame is missing (we’ve been using a milk crate in place of the leg); the other leg is cracked in one spot and is in need of a good glueing. creates the foot of the bed, retracts into the “seat” when the frame is folded into chair shape. least a small SUV – or a hatchback – to fit this into a vehicle. There is no futon (the “cushion”, or mattress) with this frame. You just get the frame. Use to have only 9 leaves now it's a small bush. I LOVE this plant! It bloomed all summer - with GORGEOUS read flowers. It's 4 years old and I hope it stays around for a long time! It got me interested in Farming/Agriculture. I took Horticulture at Fair Lawn High in my senior year back in 2009. I was basically forced into the class – I was completely against taking the course. It was only in it’s second year in progress and I wasn’t sure if it was the class for me. I didn’t have much say in the matter because my mother and guidance councilor put me in the class and by the time I found out I was in the class it was to late to take name off the roster. I’m glad I didn’t get my way in the end because if I did I may not have realized or found my love for plants and gardening. Taking the horticulture class with Ms. Meneghin showed me my love and passion for plants and nature and seeing things grow. I new before I took that class that I wanted to work out of doors in nature but I didn’t think about being a farmer. It was in the back of my mind to be one but I didn’t think I could do it because I have never grown things, been on a farm or even touched a garden. When it came to plants I was pretty much a city boy – a New Yorker one to be exact. I was involved with 4H at that point and I met many cool people at the national events that I went too. The more events I went too the more interesting people I met; some of them were farmers and the more I heard about their fun family farm stories the more I dreamed about being a farmer. This dream has became reality since I took that horticulture class. 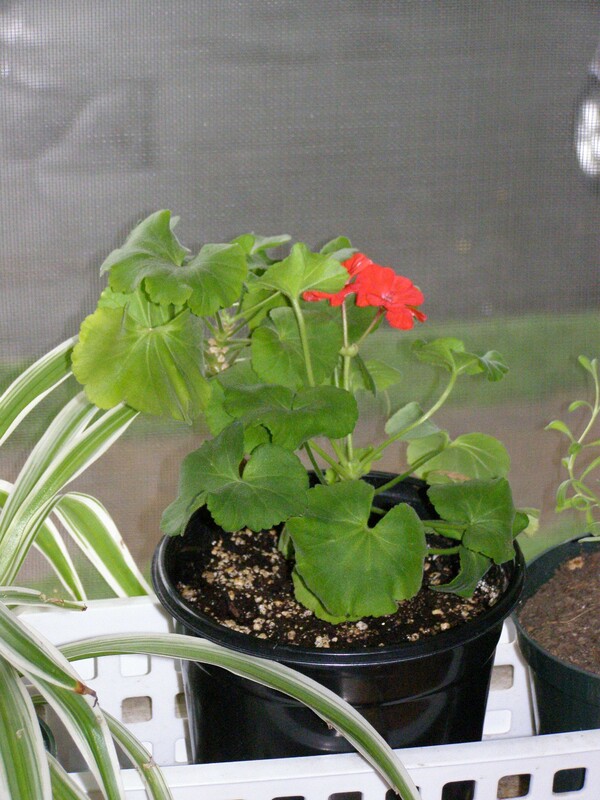 It all started with me being given one plant to take care of, which was a red flowering geranium. The geranium is still alive to this date and looks great! That plant started it all for me. I am now studying at Bergen Community College to be a farmer and will soon be on my way to Rutgers to finish my learning. I seem to have a green thumb for keeping plants alive and productive and having them do what they are meant to do. I still really don’t know what I am doing – there is a lot to learn for someone who has no real life experience on a farm. But I am getting practice with my new garden plot and I am getting a lot of production out of it and hope to continue having success. I have even had success keep plants alive in my own house which is hard because we don’t have much space for keeping plants. 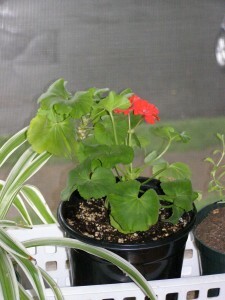 My favorite plant – to date – is my geranium. It just keeps growing and flowering. I love it and every time it grows I fall more in love with it and plants in general. The only bad thing is that my geranium keeps needed to be transplanted . . . soon it will need to be put in a large planter outside of my house because if the pots get much larger I can’t keep it in my house. That’s how great it’s doing :-). I hope when I own my farm I will continue to have great success with my plants and feed many people in the world. The start of my 2009 November was very interesting. Halloween isn’t in November but it did start my awesome 2009 November weekend. I hung out with my buddies, got loads of candy, performed at an Obama/Corzine Rally in Newark, NJ and then walked around Newark for a bit and ordered my first Dinner for my brother and I. Yes, I have ordered food for myself before but not for another person and not at a Brazilian Restaurant where I didn’t understand the menu 100 percent. I understood some of it because I’ve been to Brazilian Restaurants before and Portuguese is a bit like Spanish and my Spanish isn’t that horrible – thankfully, but it does need a lot of practice. My mother knew about the restaurant, Nova Cosa, because she has eaten there before. She said, “A small plate is $8 and it comes with chicken, fries and rice. Or you can get your own chicken, rice and other food then weight it.” For those who don’t know, that means get what you want and then pay by the pound. “We’ll try one small plate for now” I responded. When the food came I said to my brother, “This is a small plate?! That’s a lot of food.” It was 4 very nice chicken legs and a nice portion of fries and rice and beans. Before we ate I ordered us a can of Coke. We demolished the food and were satisfied. The entire meal and the can of Coke cost us only $10. Two adults ate for $5! And we got to see President Obama and walk around Newark – which we love, so does my mother. In all that was a great weekend. Free candy, hanging out with friends, meeting new people, hearing and SEEING President Obama speak and then ALMOST shaking his hand. Even though I didn’t shake his hand I had a nice weekend. Shaking his hand would’ve only ADDED to the AWESOMENESS of the weekend. My brother and I are part of a Chinese Lion Dance Troupe and we perform all over the Metro-Tri State area and at different venues and events. Some of the performances we’ve done have been really exciting and interesting, but NONE of them compared to what we did on November 1, 2009. We got to perform at the Obama/Corzine Rally that was in Newark at the Prudencial Center, that’s right where the Devils play (if you follow hockey or are a Devils fan). It was great to perform at an event that Obama himself was at. Our troupe as well as other performers where at the rally. I wanted to watch some of them but couldn’t because all the performers where backstage and couldn’t watch. In the end it was all worth it because after everyone performed we, the performers, got to go back on the stage and hear all the speeches and see the speakers up close. We were about 15 feet away from the podium – that’s right 15 feet! Some people where closer because they were right up against the barriers, but I thought 15 feet was fine. I got to hear the mayor of Newark speak, Mayor Cory Booker, Corzine and last but not least President Obama! All the speakers where good and I love hearing Mayor Cory Booker speak, he’s great. I’ve been fortunate enough to hear him speak a few times. As for President Obama I just love the guy and I LOVE hearing him speak. Seeing him – was TOTALLY AWESOME! I’ve alway wanted to see him in person ever since he ran for President. I was fortunate enough to get this opportunity as well as perform for him. He’s a brilliant and elegant speaker and a pleasure to hear – even better in person. And I was so close, it was a GREAT experience. Not many people get to see presidents speak, especially while they’re in office. My brother and I are fortunate enough to have been able to see Obama speak and be THAT close – 15 feet away – it was AWESOME! I’m so glad I went, even though we had to wait forever outside before we were allowed into the Prudential Center and go backstage. It was all worth the wait though. One more thing I liked to see was all the safety pre-cautions they were taking for Obama’s safety. It was great to see that – it made me feel that he was safe. Which is good because he is the man we need for change. I think he’s doing a great job under the circumstances. A friend of mine and I decided to go Trick-or-Treating, or TOT as we’ve been calling it. Except people don’t know how cool TOTing is and they make fun of us for saying it. We are trying to make that word known around the world! Then everyone will all TOTing instead of Trick-or-Treating, which is getting old and boring. Last Halloween it was just going to be the two of us because I didn’t feel like getting a group of kids together to go TOTing instead of the usual – which we usually do every year prior. But my buddy then invited a mutual friend and my brother decided to tag along with us instead of going with his friends. Then two of my neighbors, who are sisters came to my door and asked if I wanted to got TOTing with them, I said I was going with my people. One of the sister and her friends didn’t want to go with her sisters big group – they wanted to go separately. I invited the sister and her small group of friends; which turned out to be 4 people! So our group of 2 became 8 without me doing anything. As the night went on we met up with more people. It was a ton of fun to have a big group of people going TOTing, except it’s very hard to get candy from people when there are about 10 kids. But we managed it and we all got loads of candy! It helps a lot when people leave bowls out. Being teenagers We help ourselves into taking more then 1, you all know that feeling; the bowl is just there, it is late – no one is going come out to go TOTing anymore. Your saying, “It’d be a shame if nobody took the candy that they bought. I’ll help them out!” Before you know it the bowl is empty. I go through that thinking a lot and that ALWAYS happens. The bright side to taking all that candy is that I don’t like candy as much and I just go TOTing to chill with my friends, not so much for the candy anymore. Because candy is very bad for you but hanging out with friends is fun and We are keeping the spirit of TOTing alive, since it seems less and less kids go out on Halloween. Maybe We’ll fix that trend and get more people out this Halloween. Just remember to always be safe!